A close up of the print is seen here. 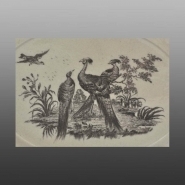 An oval creamware underplate printed in the Sadler and Green pattern Liverpool Birds. Molded feather edge rim. Unmarked, but attributed to Wedgwood.